For LED lighting systems to be reliable, all of the components and subsystems must be protected effectively against these dangers, which are encountered during assembly, maintenance and operation. High-performance ESD and overtemperature protection can protect against these dangers, resulting in a longer lifetime, lower maintenance costs and increased reliability of the LED lighting system. 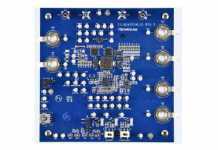 The use of high-quality protection ESD and overtemperature components provide effective and cost-efficient protection for LED arrays, their power supplies and control circuits. An LED bulb – or more technically, a luminaire – is made up of three basic subsystems: an LED power supply, a power-input connection to the grid, and an LED engine. The LED engine can be further broken down into LED arrays, LED drivers and control units. Over the past several years, smart LED luminaires have gained popularity due to features including remote control and maintenance. Because of this, a fourth subsystem – communication power supplies and interfaces – is also often integrated into the luminaires. This allows smart networked lighting systems to be deployed that maximize the efficiency and quality of lighting, and helps facility managers know the status of each luminaire for maintenance. As the LED lighting system technology has matured, engineers realized they needed a way to prevent ESD events and high energy surges from affecting the luminaire and to ensure system reliability. These surges can cause both immediate failures (often at a junction) and an increased rate of degradation caused by latent damage. Each of the four subsystems can be exposed to events that cause this kind of damage. As engineers review the energy levels of possible events, they can determine what suitable protection devices are needed. Voltage-dependent resistors, also known as varistors, have long been a solution of choice for overvoltage protection. This is because the electrical resistance varies with the applied voltage. Engineers should select varistors that are designed to hold up to the conditions of the end application. Take for example the protection of power supplies. Metal oxide varistors are especially well-suited to protect the power supplies of LED lighting systems from larger energetic surges. The design may specify varistors that feature a compact design, or that provide protection against big ESD events such as lightning strikes. And, due to the harsh nature of the elements and cost of maintenance, LED lighting systems designed for streetlights should meet both ANSI/IEEE C62.41.2 and the DOE MSSLC Model Specification for LED roadway luminaires. In these cases, surge arresters combined with varistors offer a space-saving integrated solution with the most ideal performance. 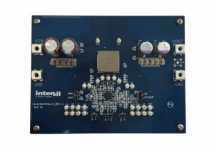 In the power input connection, a single package consisting of a disk varistor connected in series with a thermally coupled fuse is best suited to provide the protection required. In this case, if the varistor overheats, the thermal fuse – which is encapsulated in a plastic housing – disconnects the varistor from the power circuit preventing fire, safely shutting down the system. Transient-voltage-suppression (TVS) diodes have been used for many years to protect circuits from low-voltage ESD events below 25 Joules. However, multilayer varistors offer important advantages over traditional TVS diodes. These include more miniature sizes and insertion heights, more dependable performance, faster response times, and better overall operation across wide temperature ranges. In addition, TVS diodes can effectively be used to meet the absorption requirements in relation to component size. 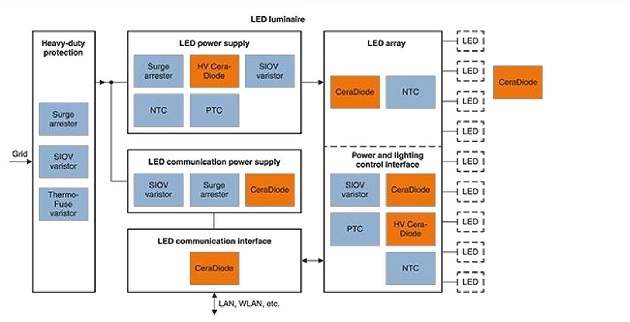 LED engines can consist of hundreds of LEDS which are normally series-connected strings, parallel-connected strings or a combination of both. If one LED fails in a series-connected string, the entire series will fail. This is because LEDs in a series-connected string can cause an antenna effect making the array more sensitive to ESD events. Multilayer varistors can provide protection against such events. Networks are often reconfigured, moved, replaced and taken offline for maintenance. Consequently, hot swapping is a common practice, and hot swapping can cause ESD events and low-voltage spikes. Multilayer varistors or TVS diodes that have extremely low parasitic capacitance are preferred for the ESD protection of data lines for the control of luminaires. Such diodes will ensure that the devices would remain fully functional for their specified lifetimes. Diodes and varistors are designed to meet unique design challenges for many applications. These solutions are often ruggedized, have a much smaller footprint, or are designed to protect against certain types of surge currents. For example, the EPCOS CeraDiode from TDK is designed to absorb high energy at a better rate than TVS diodes and has a smaller footprint. 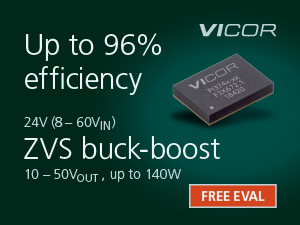 80 percent of the component volume of this product is used to absorb the energy ESD events, which is superior to the 30 percent of standard TVS diodes – and it has the same performance. Because of this, non-standard parts should be considered if they can help minimize space requirements and provide an identical or improved performance. 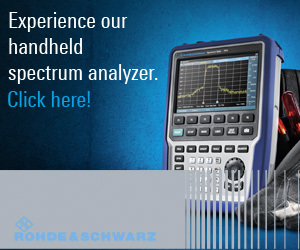 This is particularly important in applications that require miniaturization, reliable protection, and high performance. Another example is bidirectional protection against ESD and transient disturbances provided by multilayer varistors. A typical TVS diode is inherently unidirectional, making it necessary to design in two diodes. However, varistors provide bidirectional protection as a single component with the same protection. In this case, varistors will provide a size and cost advantage to the design. Other varistors provide reliable performance at higher temperatures. A typical TVS diode starts derating at room temperature, which is much lower than many applications require, making it crucial to select a varistor that can operate reliably over a very large temperature spectrum, thereby limiting failures caused by temperature fluctuation. In most cases, sudden failures in LED lighting systems are caused by thermal stresses. Because LEDs require a constant current to deliver an uninterrupted luminance, their temperature must be controlled precisely within narrow limits. Thermistors, or thermally sensitive resistors, are an accurate and cost-effective sensor for measuring temperature. A thermistor is a device whose electrical resistance is controlled by temperature. There are two types of thermistors: NTC thermistors and PTC thermistors. In NTC thermistors, or negative temperature coefficient thermistors, resistance decreases as temperature increases. In PTC thermistors, or positive temperature coefficient thermistors, resistance increases as temperature increases. NTC thermistors come in surface mounted design (SMD) packages, and protect the LED arrays against overheating and help control their temperature profile at peak lumen efficiency. 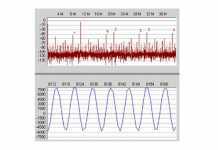 This is performed by automatically adjusting the current to the LEDs. Together with intelligent circuits, they enable an effective control system. 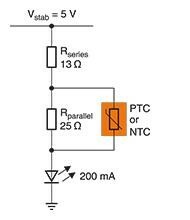 In temperature-compensated LED driver designs without integrated circuits, PTC thermistors can reduce the high temperatures of the forward current by placing them in series to the LED. In such a design, most of the LED current flows via the PTC thermistors. 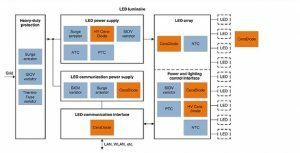 As LED technology continues to mature, design engineers can increasingly prevent the high- and low-energy surges and ESD events that affect LED reliability by simply determining the most suitable protection devices that are required by the application. In addition, they can also plan for the proper temperature protection needed in their applications, thereby keeping the lights on in a very literal way.